Whether you have a plane to catch at Orly Airport or a meeting at the ICADE SILIC business park or Rungis International Market, the ibis Paris Orly Rungis team looks forward to welcoming you to a warm and friendly atmosphere for a pleasant experience. The ibis Paris Orly Rungis hotel is located in the Delta resort area, 5 minutes from Orly airport and with a free airport shuttle. The hotel is close to Rungis International Market, the Orly-Rungis ICADE SILIC business center and Jean Monnet convention ce nter. 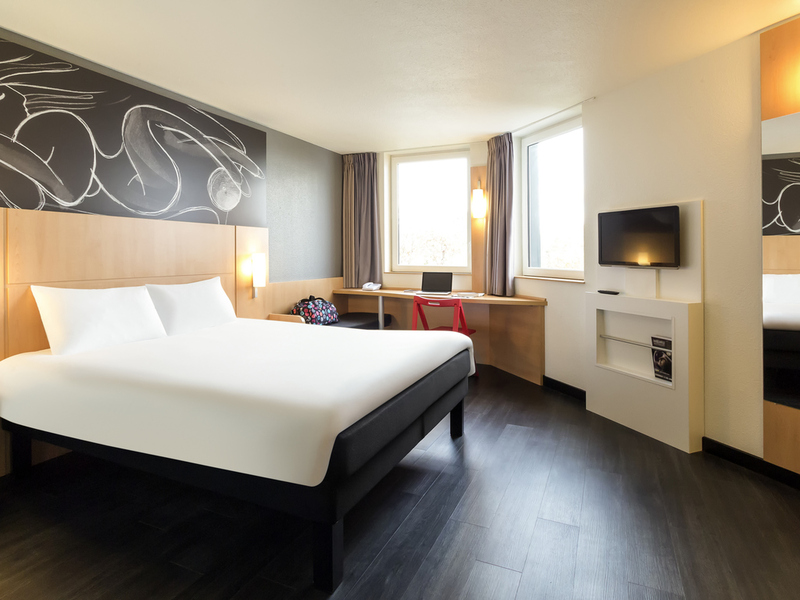 The 3-star ibis Paris Orly Rungis hotel offers modern rooms with air conditioning, an ibis Kitchen restaurant, bar, 24-hour snacks, terrace and paying private car park. The hotel offers 2 conference rooms for your meetings. The ibis Paris Orly Rungis hotel is within easy reach of Paris via Porte d'Orléans or Porte d'Italie. Plus, the hotel is ideally located for visiting the Rungis international market (MIN), the SILIC Rungis business park, Espace Jean Monnet and Orly Airport. Other tourist attractions easily accessible from the hotel via the highway: Palace of Versailles, Château de Fontainebleau, Disneyland Paris. Our restaurant is open Monday to Thursday evenings. An original, colorful offering with something for everyone. The convivial buffet and traditional dishes to share with ease. We had a rather good experience. We came mainly for business with Rungis market, stayed 2 nights. Small but practical room, well equipped, perfect bathroom, with shower appreciated ! On improvements to be done i would give a training to the staff regarding rungis and ways to get there... We were advised to go down to a discotheque and take the VIP access and up the 'passerelle'... well... not very safe for 2 ladies... Also, a friend came to pick us up and had to pay 4 euros for 2 minutes wait, should not be charged !!! but we had a good experience and would come back anytime. I loved the hotel, nice room but the service at the lobby could be beter! I didnt like the enviroment of the hotel. But itw as a nice stay! Good but the bus to go to the airport was an epic ride. Too many people, not enough space, people fighting because afraid of missing their flights. You should have more shuttles during pic hours. It was not even safe as the driver made us over pack the bus to try to get as many people in. Poor cleanliness and comfort of room. No toiletries. Rude wait staff. Just two things we did not like. One side of the bed was against the wall making it difficult for the person on that side to get in and out of bed. We were in room 100 and the therostat is backward, hot is cold and cold is hot. So we suffered from the cold until I went to reception to understand why. The receptionist explained the backwards thermostat. We thought it very poor management not to place a note by the thermostat. Extremely friendly and helpful staff .
. It took 2 wretched hours to get there. Terrible experience. Arrived on a cold, wind blown rainy night with a print out of the reservation with photo included. The Orly information people told us what shuttle/where to take to hotel. The driver (shown the reservation printout) dropped us off more than a block from an Ibus and pointed. Arrived wet to find out we were at the wrong Ibus, the desk clerk put a large mauve post it on my paper with the Large words &quot;AUTRE HOTEL&quot; . OK - we walked back to Orley where Information personal now called. Was handed the phone where explained our situation. Was put on hold after being told he would have to talk to his supervisor(? ), after 15 minutes music he disconnected. She called back and spoke curtly to the individual and was given the correct shuttle information. When we arrived went to our room and found no towels in a room not as booked. Was supposed to be a twin room, was not. Had to go to desk to retrieve towels as there was only one individual on duty. Do Not know how you managed the photograph but have never been in a smaller room. Ever. The photographer is wizard. Was a total surprise. Our 14&quot; wide carry on could no be placed in that direction at end of bed! The staff was exceptionally pleasant and apologetic. The room was very clean. The breakfast buffet was the best have ever encountered - (and have traveled a lot.) Would suggest clear directions given at booking with What shuttle stop number, etc. for Correct Ibus hotel. Had a fellow traveler the next day say we were fortunate as there are 3..... Also could add &quot;cozy&quot; to indicate size? The rooms smelled off, and the hallways. Also some of the front desk staff were rude, and seemed bothered that I had a question. good option in the Orly Airport area. Hotel is clean and properly located in the orly airport area, staff very friendly and polite. Only drawback hotel - airport shuttle did not run 24*7 hence I had to take a taxi to the airport and add the cost. When I verified hotel amenities airport shuttle was included, with no mention to night limitation. Very functional hôtel if you have to work in the area. Very friendly staff. Nice hotel. AC worked well during the heat wave. Clean and quiet room. Very nice staff. Very easy check in and out. Room very clean and good toilets. Negative point: the restaurant was close without any info and I had to walk to the Mercurie to have my dinner. Well priced, clean as usual for ibis.